“Love me and one another” – yes, but the picture? A hidden message maybe? Real.ly a puzzle. 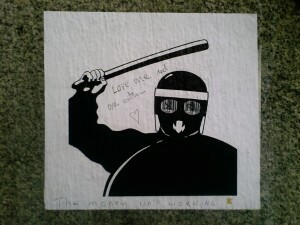 And “The money isn’t working” is so true these days in the City. The money is on holidays while the bankers are fired.